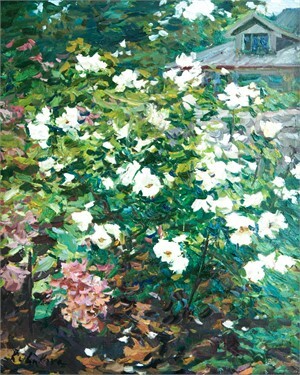 Irina Rybakova is a famous Russian master of landscape. The image of the Russian village and the village worker are her dearest subjects. Her art is appreciated in museums and collections both in Russia and abroad. Irina worked as part of the artistic group Academica dacha in Vyshny Volochek, the oldest and well-known creative base of the Union of Artists of the Russian Federation. In 1991 she entered Kostroma (a historic city) department of Artists Union in Russia. Promotes the contemporary realistic school in art in mass media. Image of the Russian village and the village worker are her most dear subjects and does not like landscapes without humans. The humanity, fed on pop-art and conceptual art, feels monstrous moral and spiritual emptiness. Irina Rybakova (b. 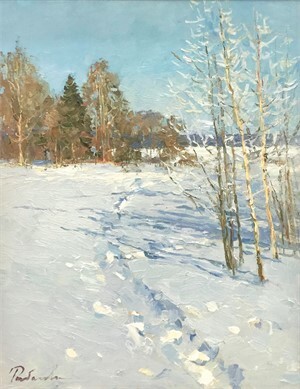 1962 in Vyshny Volochok) Irina Rybakova is a famous Russian master of landscape. The image of the Russian village and the village worker are her dearest subjects. Her art is appreciated in museums and collections both in Russia and abroad. 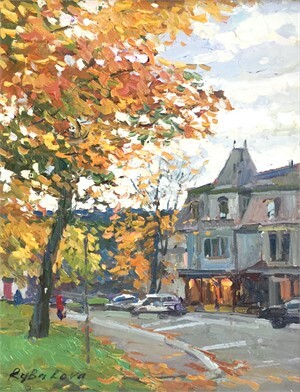 Irina worked as part of the artistic group Academica dacha in Vyshny Volochek, the oldest and well-known creative base of the Union of Artists of the Russian Federation. In 1991 she entered Kostroma (a historic city) department of Artists Union in Russia. Promotes the contemporary realistic school in art in mass media. Image of the Russian village and the village worker are her most dear subjects and does not like landscapes without humans. The humanity, fed on pop-art and conceptual art, feels monstrous moral and spiritual emptiness.